Public Health Pharmacology & Tox. Consultancies | Department of Public Health Pharmacology & Tox. Department of Public Health Pharmacology & Tox. The University of Nairobi, Department of Public Health, Pharmacology & Toxicology (PHPT) contracted by the Ministry of Livestock Development to undertake a consultancy to analyse for levels of heavy metals, drug and pesticide residues and aflatoxin M1 in camel milk in order to determine the safety of the milk for human consumption. A total of 13 milk samples were collected from Nanyuki and analysis was done. Heavy metal analysis was done using Atomic Absorption Spectroscopy. Analysis for pesticides was done using Gas Liquid Chromatography fitted with an ECD detector at a detection limit of 2pg for organophosphates and pyrethroids and an FID detector for organophosphates residues with a detection limit of 3fg/s. Drug residues were analysed using High Performance Liquid Chromatograhic Technique (HPLC) using a visible light detector (detection limit 1.0 ppm). Analysis was done for diminazine aceturate, hominidium bromide, albendazole and levamisole. Levels of aflatoxin M1 were determined in the milk samples (n=15) using Enzyme Immunoassay and the detection limit was 5 ppt. The results obtained showed that all the samples contained arsenic at levels ranging from 0.007 to 0.099 ppm. However, the levels of lead ranged from 0.072 to 0.449 ppm. The pesticides detected in the milk samples were heptachlor epoxide, aldrin, 2’4’DDT, 4’4’DDT 4’4’DDD, endrin, deltamethrin and cypermethrin in 7%, 20%, 7%, 13%, 40%, 7%, 73% and 87% respectively. None of the samples analysed contained quantifiable levels of veterinary drug residues at the detection limit of 1ppm. The samples were also not found to contain detectable levels of aflatoxin M1 at detection limit of 5 ppt. Based on the results of the study, some of the analyses were at safe levels while others were at levels above the recommended maximum residue limits (MRL) and acceptable daily intakes (ADIs). The University of Nairobi signed a consultancy agreement with FAO to undertake a livestock and meat value chain analysis on live animals, meat and livestock products in Somaliland in March/April 2011. The analysis aimed to understand factors that affect the development of a competitive Somaliland livestock and meat industry as well as identify areas of intervention to foster its development. 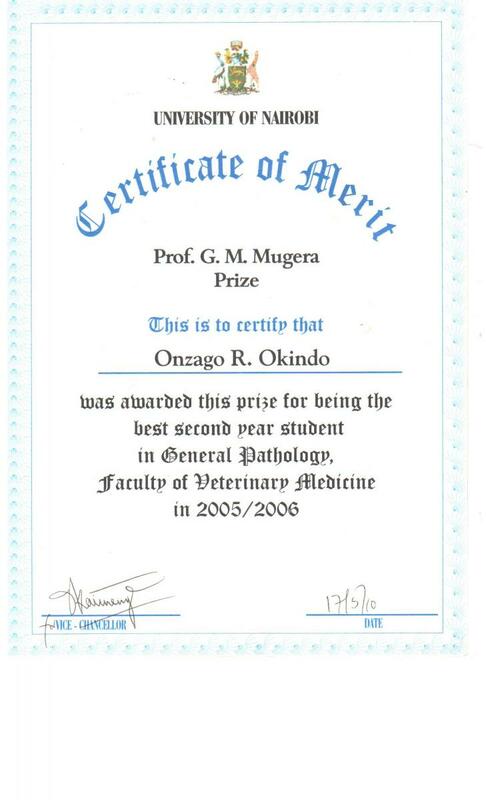 The project was undertaken by staff from the Faculty of Veterinary Medicine. Data was collected from primary sources through focus group discussions using key informants, stakeholder workshops, observations of livestock marketing infrastructure and activities, slaughter and meat marketing activities, as well as trade in hides and skins. Secondary data was collected through literature search and available reports on various livestock issues. The study found out that Somaliland has organized livestock marketing and trading activities facilitated by organized livestock markets and elaborate quarantine stations that are based at the port of Berbera. However, livestock slaughter and marketing of meat faced a number of challenges that included inadequate infrastructure (Slaughterhouse and associated facilities and equipment), poor hygiene and lack of meat inspectors to carry out quality assurance of meat. The University of Nairobi signed a consultancy agreement on 11.01.2012 (LoA No.159/2012) with FAO Somalia to provide training services in public health to Somali Master trainers on best practices in meat inspection and prevention of food borne diseases and zoonoses. The Objective of the consultancy was to enhance the capacity of public health officers to effectively perform their public health service delivery roles in Somalia. 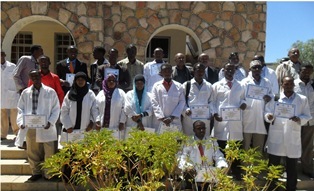 The consultancy lead to the development of a training manual that will be used to train Public Health Practitioners in Somalia and in training of six master trainers (4 veterinary and 2 medical professionals) who could to take charge of the training of public health practitioners in Mogadishu and other parts of Somalia. UoN lecturers with the six trainees from Mogadishu, Somalia at the end of the training period in the Department of Public Health, Pharmacology and Toxicology. The University of Nairobi signed a consultancy agreement with FAO to provide training of personnel working in the meat subsector at certificate level on meat hygiene and quality assurance in both Somaliland and Puntland. The objective of the consultancy was to develop capacity for the Ministries of Livestock in both Somaliland and Puntland to implement meat quality assurance through training of staff to certificate level. The training was undertaken by staff from the Faculty of Veterinary Medicine through the Department of Public Health, Pharmacology and Toxicology between November 2012 and March 2013. Forty four staff (24 in Somaliland and 20 in Puntland) undertook the training that will lead to award of the Certificate in Meat Hygiene and Quality Assurance of the University of Nairobi. Land O Lakes signed a consultancy agreement with the Department of Public Health, Pharmacology to undertake a study on capacity assessment of food and dairy oriented analytical laboratories in Kenya. The study was carried out in sixty eight food and dairy oriented laboratories in Kenya to assess their potential capability to conduct bacteriological and chemical analysis of milk and milk products to international standards. The assessment exercise revealed that there is a large number of food and dairy orientated laboratories that conduct chemical and bacteriological analyses of milk and milk products. However, the capacity of the majority of these laboratories to generate internationally acceptable results is limited by inadequacies in terms of appropriate equipment, chemicals, reagents, and qualified personnel. The assessment revealed that only a limited number of laboratories had the capacity to potentially generate internationally acceptable chemical and bacteriological results. Many of the laboratories lacked appropriate equipments and accreditation status to allow them perform to the desired international standards. Few laboratories had be accredited to ISO 17025 and regularly calibrated the equipment. The study concluded that, there is need to strengthen one or two laboratories in each province with the required technical competence to produce internationally acceptable chemical and bacteriological data. The Department of Public Health, Pharmacology and Toxicology was awarded a consultancy by African Union-InterAfrican Bureau for Animal Resources to train veterinary staff from the greater Horn of Africa on surveillance and epidemiology of trade-related transboundary animal diseases(TADs) under USAID/EA funded project on Standard Methods and Procedures in Animal Health (SMP-AH) project. The SMP-AH project aims to contribute to the reduction of poverty, enhance regional economic growth and integration through improved access of live animal and animal products to regional and international markets. The project will support harmonization and coordination of TADs related interventions in the IGAD region through capacity building in disease surveillance, epidemiological investigations and reporting, laboratory management, diagnostic capability and safety for communication, information sharing and regional cooperation, strengthening of disease control interventions, development of Standard Methods and Procedures for nine priority TADs and enhancement of emergency disease response. The interventions will provide building blocks for harmonized and coordinated animal health program across national borders for trade or pasture. The training in Surveillance and Epidemiology of Trade Related TADs that will take place in Nairobi from February 24 to May 31, 2014 aims to update the knowledge and skills of animal health professionals in surveillance and epidemiology of TADs as well as enhance their knowledge on collaborative and cooperative approaches in the management of the TADs at the regional level, as pastoral areas in the IGAD countries share similar ecosystems with common borders. This will ensure that traded animals are healthy in order to protect the health of human and animals in importing countries. The overall objective is to train veterinary staff in the IGAD region in functional use of surveillance and epidemiological approaches on TADs to enhance their proficiency in surveillance in the control and management of trade-related TADs in a harmonized and coordinated manner. The Department of Public Health, Pharmaacology and Toxicology won a consultancy to train veterinary staff from the Greater Horn of Africa on Surveillance and Epidemiology of trade-related Transboundary Animal Diseases (TADs). The 28 participants attending the training are drawn from six countries including Kenya, Uganda, Tanzania, Southern Sudan, Ethiopia, and Djibouti. The three-month training will lead to the award of Certificate in Surveillance and Epidemiology of trade-related Transboundary Animal Diseases. The training is being facilitated by African Union- InterAfrican Bureau for Animal Resources (AU-IBAR) with funding from United States Agency for International Development (USAID). Training started on 24th February 2014 and will end on 23rd May 2014. Transboundary Animal Diseases (TADs) constitute a constant threat to livelihood of livestock farmers in many African countries. Livestock play a key role in supporting livelihoods, food security and economic growth in most African countries particularly those made up of arid and semi-arid lands with many of its inhabitants depend on livestock resources. However, the region faces challenges of trade related Trans-boundary Animal Diseases (TADs) that impact on livestock production and trade. The impact of TADs is aggravated by differing animal health regulations amongst the countries of the region, uncoordinated disease surveillance and control programs and recurrent livestock trade bans by importing countries for fear of introduction of TADS. There is need to build capacity in disease surveillance, epidemiological investigations and reporting, laboratory management, diagnostic capability and safety for communication, information sharing and regional cooperation, strengthening of disease control interventions, implementation of Standard Methods and Procedures for priority TADs and enhancement of emergency disease response. The Standard Methods and Procedures (SMP) approach aims harmonize the work of Departments of Veterinary Services in the GHoA region in their approach to the control of trade-related Transboundary Animal Diseases. The goal is to establish region-wide baseline disease control protocols so that implementation of control programs is better coordinated, efficacy of a regional approach is enhanced, and communication among veterinary departments improved. The interventions will provide building blocks for harmonized and coordinated animal health program across national borders to prevent transboundary animal diseases. Equip veterinary professionals with knowledge and skills in functional use of surveillance and epidemiology to manage and control trade related trans-boundary animal diseases. Strengthen communication and corporation between personnel of epidemiology units throughout the region.